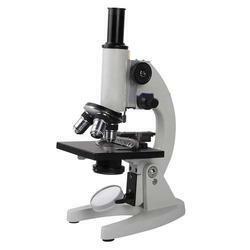 We have marked a distinct and dynamic position in the market by providing a high-quality array of Student Microscope. Stage: Fixed square stage (125mm x 125mm) with stage clips. Standard inclinable monocular body, with Horse shoe base. Triple revolving nose piece for quick change in magnification with accurate click stop for perfect parafocal alignment. Illumination: 50 mm Plano Concave Mirror For Day Light. Optionally Gl-1 Sub-Stage Microscope Lamp. 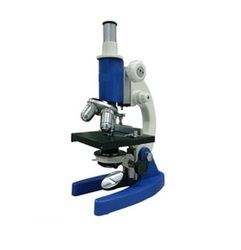 As per the specific needs of the clients, we are engaged in providing a high quality range of Student Microscope. We offer Student Microscopes with fixed bright field condensor & lris Diaphragm. Heavy metal stand with triple nose piece. Coarse adjustment by Rack and Pinion and fine adjustment precision grade slow motion arrangement in a beautiful storing cabinet.